Successfully Added Professional Walkie Talkie with Earpiece (5km, Push-to-Talk, UHF FM, 220v) to your Shopping Cart. Professional grade Walkie talkie with a bone conduction earpiece, push-to-talk finger button, and up to 5KM long range. Perfect for efficient and long range communication. Communicate like a professional; “10-4 Alpha Team, 10-99 Zone 5 Go, go, go”, and live the dream of a pro, relaying commands through a walkie talkie whilst rushing through the jungle in pursuit of the enemy. This premium two-way communication device consists of a powerful walkie talkie, also known as a HT (handheld transceiver), an earpiece and belt pin attachment. This portable walkie talkie, also known as a 2-way radios in some countries, will allow instant communication without the need for a cellphone or cup and string. This Walkie talkie is an ideal communication device for maintaining contact in many jobs and situations including; Building Security Teams, Campus Maintenance Crews, Police Departments, Fire Departments, Bike Couriers, Trade Shows and Exhibit Events, Wilderness areas where phones do not work and overseas holiday travel where using a phone may be expensive or troublesome. 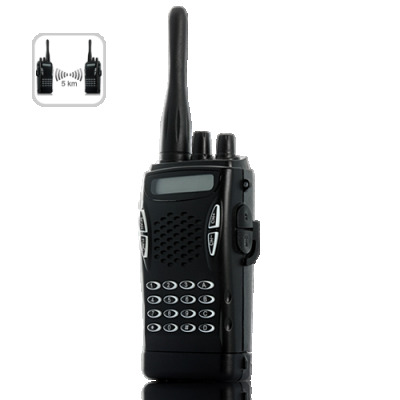 While very easy to use, this two-way radio walkie talkie is a very powerful medium-range voice communication device. It has multiple benefits over cellular phones including - Instant Communication, Easy to Talk with Multiple People at the Same Time, Free to Use, No SIM Card or Monthly Fees Required, and much more. With the ability to talk with 2 or 200 people at once, and not needing to pay any kind of monthly fees like with cell phones, you can see why many businesses have chosen to use two-way radios to keep in contact with employees and security personnel. In today's modern world, it just makes sense to use the most reliable, convenient, and economical way to keep in touch with other members of your team. This Professional Walkie Talkie with Bone Conduction Earpiece and PTT Finger button will do that, instantly. And with this special kit, you get an included press-to-talk finger button and an earpiece, so you only need to use your thumb to instantly communicate with your team, leaving your hands more free to concentrate on other matters. This Walkie talkie comes complete with a rechargeable battery + charging station and the BC earpiece, so you can start using them the minute you receive your package. If you need efficient, available two-way communication, don't wait any longer, click "Add to cart" to get your two-way radio today! Please note: This item is only available with a MOQ (minimum order quantity) of 2 units. As each unit only contains 1 walkie talkie, the MOQ ensures that you will be receiving 2 to use together. Product comes as 1 x Walkie Talkie as reflected in its price, please purchase multiple products based on your needs.